Making bread at home is fairly easy. All you need is good quality yeast, flour, water and a bit of salt, at the very basic level. Once you're confident with that you can easily expand your repertoire with a few more ingredients and even with different kinds of flour. I find focaccia to be one of the easiest breads for beginner bakers like me. I've made innumerable focaccias and so far, thankfully, I've had no disasters! On a recent visit to the market the hubby and I picked up a packet of buckwheat flour. The plan was to use it to make pancakes in place of the regular APF pancakes I was making. 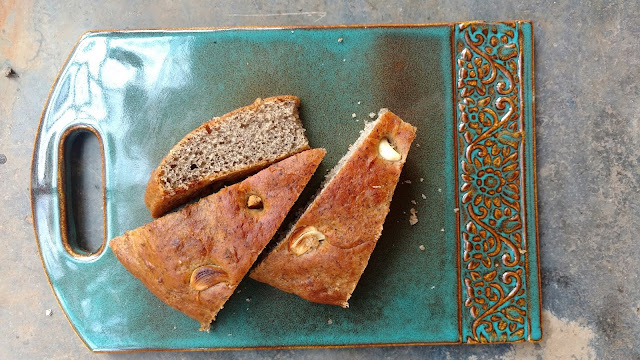 I happened to make bread at home soon after and we immediately wondered how a focaccia with some buckwheat flour would taste. I did search on the Net but found recipes that were purely for those looking for vegan or gluten free breads. Since those required ingredients I didn't have I decided to just see what happened if I replaced a certain amount of APF with buckwheat flour in my usual focaccia recipe. As you can see in the picture above, it worked! In a large bowl or in the bowl of a stand mixer mix all the dry ingredients and the olive oil. Stir for a couple of minutes to mix. Use the dough hook if you're using a stand mixer. Now pour the water into the mixture in two lots, mixing well in between additions. Don't add all the water unless you need to. Mix the dough combining all the ingredients till it comes together. If you're kneading by hand tip the dough out onto your cleaned and lightly oiled work surface and knead for a good 15 minutes till the dough comes together in a soft, slightly sticky ball. 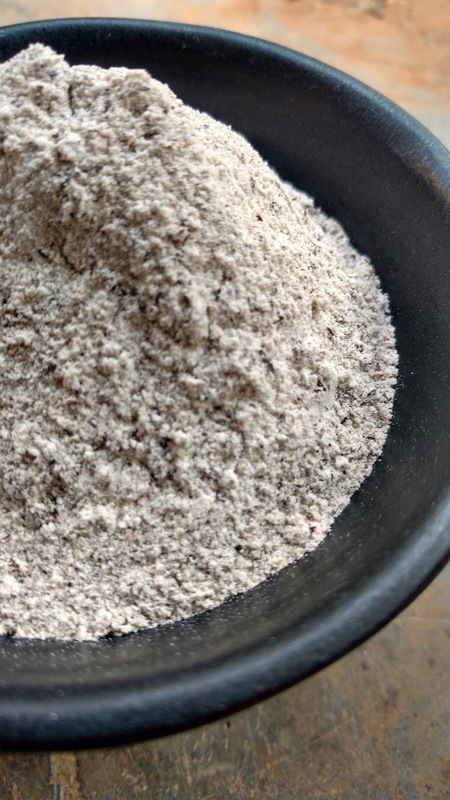 Add dry flour if the dough is too sticky but work at it steadily with a gentle hand. You can let your stand mixer do the kneading, it turns out just as well. Keep an eye on things and add a bit of dry flour if required. Once the dough is ready shape it into a neat ball and put it into a large greased (with olive oil) bowl to rise. Cover the bowl with a damp tea towel and leave it undisturbed in a warm spot till it has doubled in volume. Now turn out the risen dough onto your work surface and deflate it gently. Divide the dough into two and shape two loaves by gently patting the dough onto baking sheets. You can make the loaves thick or thin, as you like. Press holes into the surface of the loaf with your finger tips and poke in slivers of garlic, bits of rosemary, sun dried tomatoes or any other topping. Leave the loaves to rise for another 25-30 minutes. While the loaves are proofing set your oven to preheat at 200C. Once the loaves have risen properly slather generously with olive oil and bake for 15-18 minutes till done. When you tap on the loaf you should hear a firm hollow sound. 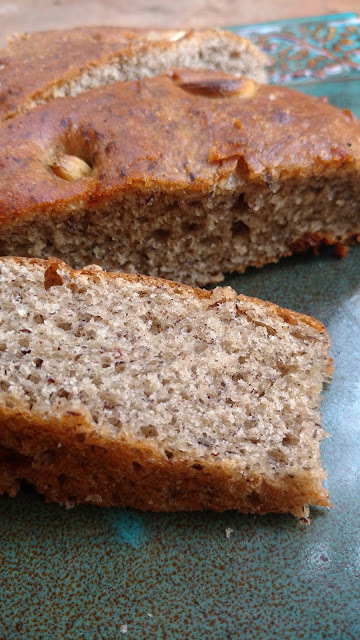 The buckwheat flour will give you a darker loaf so don't go by how brown the loaf has become. Remove from the oven and brush with more olive oil. Let the breads cool and then slice up and serve. Enjoy the focaccia with bowls of extra virgin olive oil, balsamic vinegar, soft cream cheese, and some cold cuts, or pair it with a hearty bowl of soup. You can also make superb sandwiches with this bread.